The tabbed dialog available with Tools : Statistics : Analysis (Shift+Alt+A) in SuperMemo provides graphs and tables that illustrate the current state of the learning process in the currently opened collection. In addition to Analysis, SuperMemo provides multiple other analytical tools. Intervals - distribution of inter-repetition intervals in a given collection. By changing the setting of the combo box at the bottom of the dialog, you can see interval distributions for all elements in the collection, for only items, and for only topics. A-Factors - distribution of A-Factors in a given collection. The distribution itself is not used in Algorithm SM-11, and merely results from it. Note that topics and items use different A-Factor categories. Choose Items only or Topics only at the bottom to see distributions for items or topics. If you choose All elements you will see a less meaningful conglomerate distribution indexed by A-Factor category number. Repetitions - distribution of the number of repetitions of items or topics in a given collection; only memorized elements are considered in the distribution, i.e. there is no zero-repetitions category. Lapses - distribution of the number of times particular items in the collection have been forgotten; only memorized elements are considered. You should never have more than 10% of items with more than 3-4 lapses. If this is not the case, you should re-examine the way in which you formulate items (see 20 Rules). As topics are never "forgotten" at repetition time, there are no lapses listed in Lapses if you select Topics only in the element type combo box. 400 forgetting curves are independently plotted in order to compute the RF matrix in Algorithm SM-11. These correspond to twenty repetition number categories and twenty A-Factor categories. For data representation convenience, the columns of the RF matrix for the first repetition are indexed by the number of memory lapses rather than by the A-Factor. 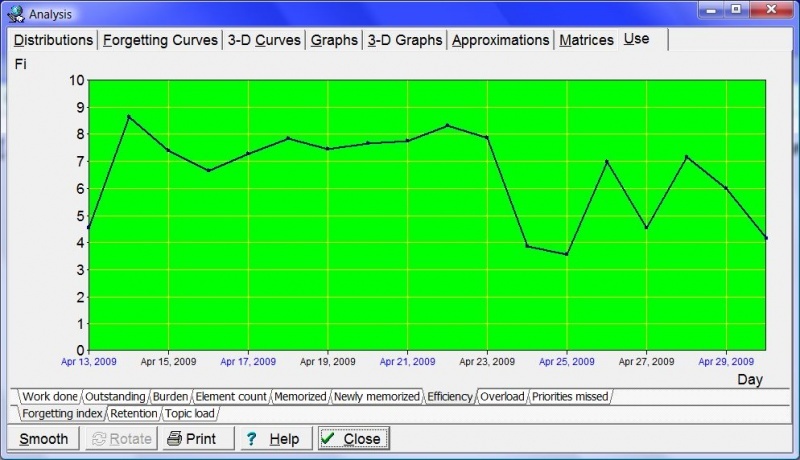 By choosing a proper combination of tabs at the bottom of the graph, you can select a forgetting curve of interest. Horizontal axis represents time expressed as: (1) U-Factor, i.e. the ratio of subsequent inter-repetition intervals, or (2) days (only for the first repetition). Vertical axis represents knowledge retention in percent. Blue circles in the picture represent data collected during repetitions. The larger the circle, the greater the number of repetitions recorded. 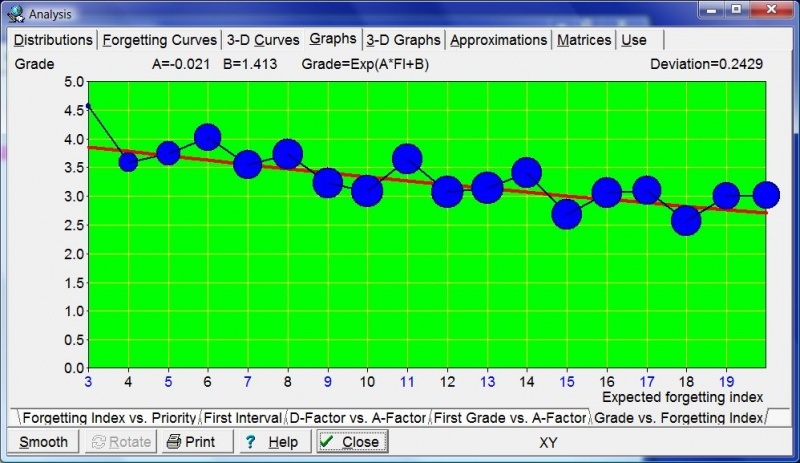 The red curve corresponds with the best-fit forgetting curve obtained by exponential regression. For ill-structured material the forgetting curve is crooked, i.e. not exactly exponential. The horizontal green line corresponds with the requested forgetting index, while the vertical green line shows the moment in time in which the approximated forgetting curve intersects with the requested forgetting index line. This moment in time determines the value of the relevant R-Factor, and indirectly, the value of the optimum interval. For the first repetition, R-Factor corresponds with the first optimum interval. The values of O-Factor and R-Factor are displayed at the top of the graph. They are followed by the number of repetition cases used to plot the graph. At the beginning of the learning process, there is no repetition history and no repetition data to compute R-Factors. 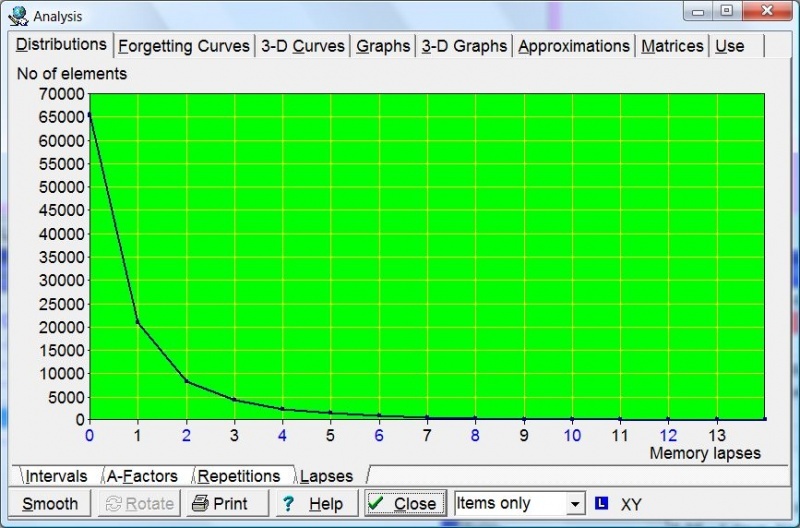 It will take some time before your first forgetting curves are plotted. For that reason, the initial value of the RF matrix is taken from the model of a less-than-average student. The model of average student is not used because the convergence from poorer student parameters upwards is faster than the convergence in the opposite direction. 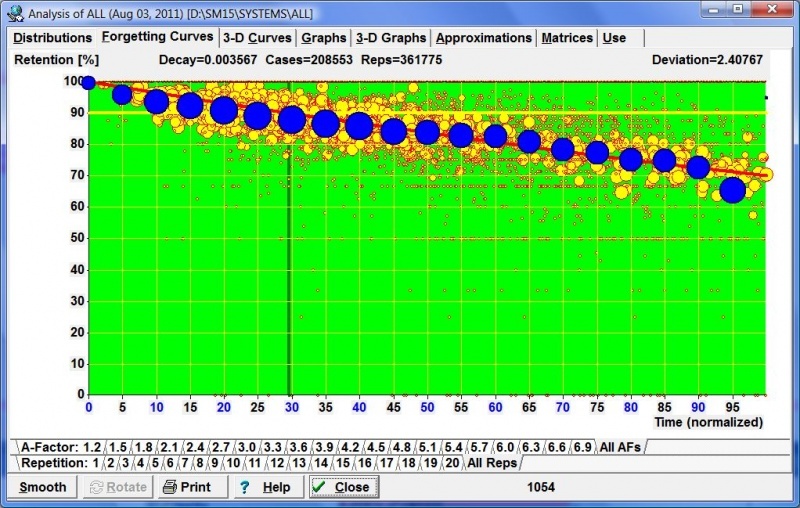 The Deviation parameter displayed at the top tells you how well the negatively exponential curve fits the data. The lesser the deviation, the better the fit. The deviation is computed as a square root of the average of squared differences (as used in the method of least squares). its negative exponential approximation used by SuperMemo (red line). Time (normalized) stands at 100% for maximum U-factor for each entry of the RF matrix. Decay stands for the decay constant of the forgetting curve. 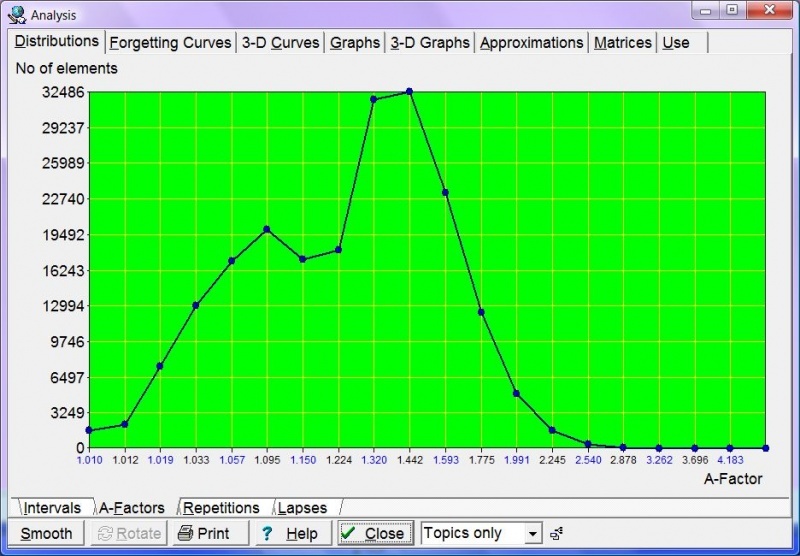 Cases shows the number of repetition cases used in plotting the graph. Repetitions stands for the number of repetitions executed when determining R-Factors. Deviation is a square root of the average of squared differences between the data and the approximated forgetting curve. 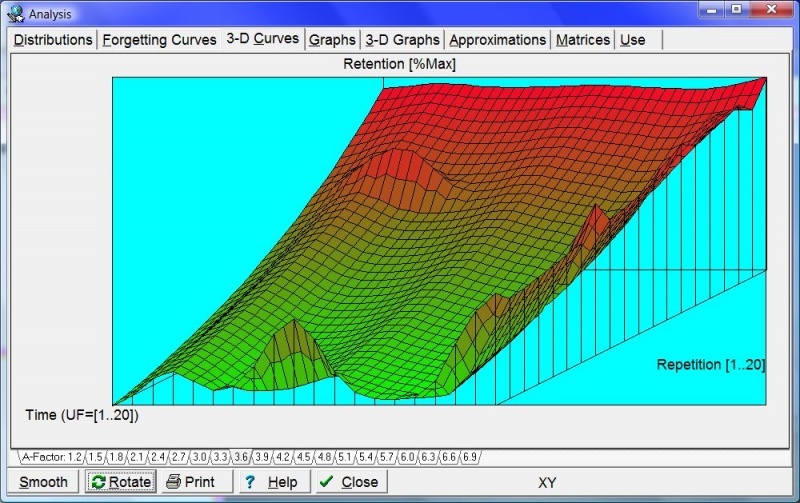 These graphs show the forgetting curves in 3 dimensions. There are 20 graphs available with A-Factor tabs at the bottom. Each graph corresponds to a different A-Factor (from 1.2 to 6.9). The X axis represents time (as in Forgetting curves). The Y axis represents repetition category (roughly corresponding to the repetition number). The vertical Z axis represents retention in percent (i.e. how much is remembered at a given moment in time). For better visibility, you can rotate 3-D forgetting curves with Rotate, or smooth them with Smooth. Rotate swings the graph on its Z axis by 90 degrees clockwise (as viewed from above). This means that X and Y axes get swapped. Note that smoothing proceeds along the Y axis. 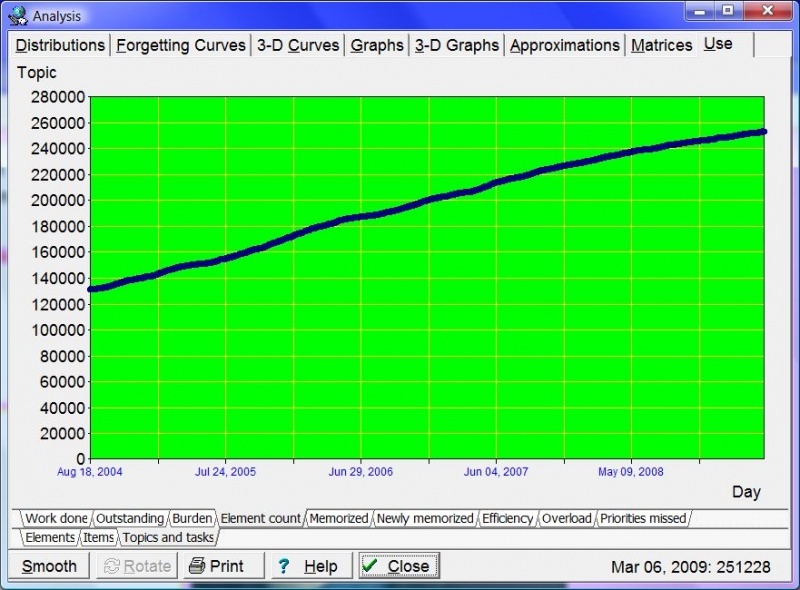 This makes it possible to align incompletely plotted forgetting curves from different repetition categories. However, once you click Rotate, Y axis smoothing will produce a different result (e.g. after the first Rotate, smoothing will reduce kinks along the repetition categories). For the best illustration of the forgetting process, smooth the graph before you rotate it. 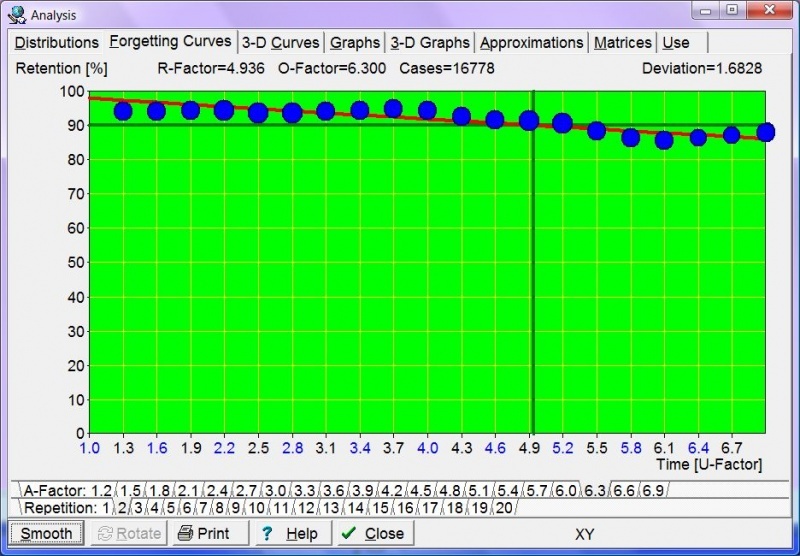 Exemplary 3-D graph of forgetting curves for A-Factor=3.6. The graph has been smoothed along the Y-axis (by averaging results corresponding to different repetition categories), and rotated once for better visibility (the slope illustrates forgetting in time that is roughly similar for various repetition categories except those with high repetition number that may reflect scarcity of data for long intervals). Forgetting Index vs. Priority - this graph shows you how forgetting depends on the priority of the learning material. If you always go through your outstanding material in time and if you stick to the 20 rules of knowledge formulation, your measured forgetting index should be the same as the requested forgetting index. This graph will then show a flat straight line passing horizontally at the level of the forgetting index. However, once you start overloading the learning process and using Postpone or Mercy, your measured forgetting index will increase. If you always sort your repetitions by priority (e.g. by leaving Learn : Sorting : Auto-sort repetitions checked), you should still ensure that your measured forgetting index equals the requested forgetting index for high priority elements (i.e. on the left side of the graph). Your measured forgetting index for low priority material will be higher, and the greater the overload the greater the difference. If you change your repetition sorting criteria by increasing randomization of repetitions, this graph will be flatter and the measured forgetting index for high priority material will be higher. First interval - the length of the first interval after the first repetition depends on the number of times a given item has been forgotten. Note that the first repetition here means the first repetition after forgetting, not the first repetition ever. In other words, a twice repeated item will have the repetition number equal to one after it has been forgotten; the repetition number will not equal three. The first interval graph shows exponential regression curve that approximates the length of the first interval for different numbers of memory lapses (including the zero-lapses category that corresponds with newly memorized items). In the graph below, blue circles correspond to data collected in the learning process (the greater the circle, the more repetitions have been recorded). D-Factor vs. A-Factor - DF-AF graph shows decay constants of the power approximation of R-Factors along columns of the RF matrix. You need to understand SuperMemo Algorithm to understand this graph. The horizontal axis represents A-Factor, while the vertical axis represents D-Factor (i.e. Decay Factor). D-Factor is a decay constant of the power approximation of curves that can be inspected in the Approximations tab of the Analysis dialog box. First Grade vs. A-Factor - G-AF graph correlates the first grade obtained by an item with the ultimate estimation of its A-Factor value. At each repetition, the current element's old A-Factor estimation is removed from the graph and the new estimation is added. This graph is used by SuperMemo Algorithm to quickly estimate the first value of A-Factor at the moment when all we know about an element is the first grade it has scored in its first repetition. Grade vs. Forgetting Index - FI-G graph correlates the expected forgetting index with the grade scored at repetitions. You need to understand SuperMemo Algorithm to understand this graph. You can imagine that the forgetting curve graph might use the average grade instead of the retention on its vertical axis. If you correlated this grade with the forgetting index, you would arrive at the FI-G graph. This graph is used to compute an estimated forgetting index that is in turn used to normalize grades (for delayed or advanced repetitions) and estimate the new value of item's A-Factor. The grade is computed using the formula: Grade=Exp(A*FI+B), where A and B are parameters of an exponential regression run over raw data collected during repetitions. Twenty power approximation curves that show the decline of R-Factors along columns of the RF matrix. You need to understand SuperMemo Algorithm to understand these graphs. For each A-Factor, with increasing values of the repetition number, the value of R-Factor decreases (at least theoretically it should decrease). Power regression is used to illustrate the degree of this decline that is best reflected by the decay constant called here D-Factor. 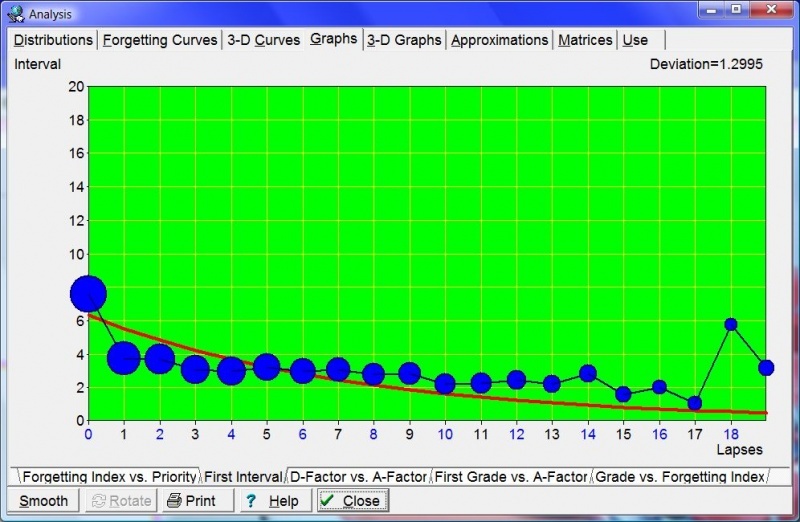 By choosing the A-Factor tab at the bottom of the graph, you can view a corresponding R-Factor approximation curve. The horizontal axis represents the repetition number category, while the vertical axis represents R-Factor. The value of D-Factor is shown at the top of the graph. The blue polyline shows R-Factors as derived from repetition data. The red curve shows the fixed-point power approximation of R-Factor. The green curve shows the fixed-point power approximation of R-Factor derived from the OF matrix; this is equivalent to substituting the D-Factor obtained by fixed-point power approximation of R-Factors for the D-Factor obtained from DF-AF linear regression. A fixed-point approach is used for both approximations since for the repetition number equal to two, R-Factor equals A-Factor. You need to understand SuperMemo Algorithm to understand these tables. Graphs of changes in the statistics of the learning process over time. 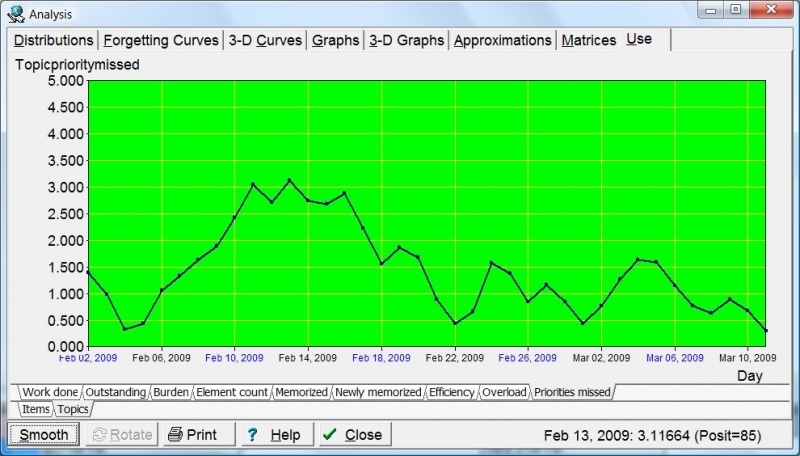 These graphs record daily changes to statistics such as the number of memorized items, measured forgetting index or the number of outstanding items for a given day. The first non-zero value of the day is recorded. If that value increases afterwards, that increase is ignored (except a few cases such as the statistic of newly memorized items, etc.). If you have a break in learning, the last recorded non-zero value will propagate through the period in which you did not use SuperMemo (except a few cases such as the statistics of repetitions made, etc.). 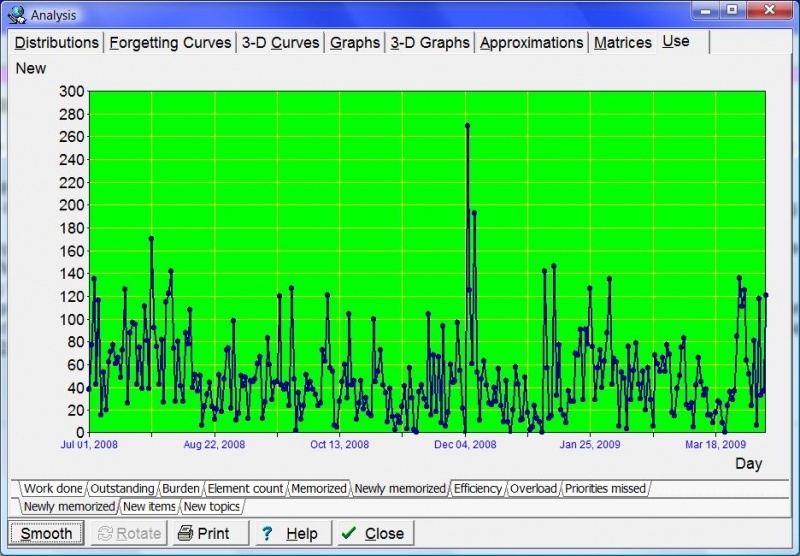 Exemplary graph showing the total number of topics stored in the collection. The data displayed at the bottom depends on the position of the mouse. In this example, it indicates that on Mar 6, 2009, there were 251,228 topics in the incremental reading process. Exemplary graph showing the number of elements memorized on individual days. By sweeping away the left and right part of the graph, it is possible to zoom in on a small section of the learning process. The period shown on the graph spans from Jul 1, 2008 to Mar 19, 2009. Exemplary graph enabling a more meaningful analysis of the forgetting index: changes to forgetting index in Analysis use the daily measured forgetting index (previously: less informative cumulative measured forgetting index value was used taken for the entire period since the last use of Tools : Statistics : Reset parameters : Forgetting index record). Note that the priority queue may distort the actual retention in your collection as measured values are primarily taken from top-priority material. Thus measured forgetting index should be understood as "forgetting index measured at repetitions", not as "overall measured forgetting index". Exemplary graph showing the highest priority topic (with the lowest priority %) that was missed in repetitions. The data displayed at the bottom depends on the position of the mouse. In this example, it indicates that on Feb 13, 2009, the worst miss amongst topics was a topic with Priority equal to 3.11% standing at the position 85 of the queue of the most important topics to review.